This may be the most dramatic example of a place that was once at the top of the list for tourism at Grand Canyon and is now almost inaccessible. So, hiking this route (once a trail but no longer) combines a significant degree of historic value with quite a severe physical and mental challenge. In G.W. James' guide of 1900 he called this the "Old Trail." I had hiked many of the obscure lost trails and routes in Grand Canyon before this one. Along with two other hikers we did the classic dayhike loop described by Harvey Butchart in GCT1  going down the Old Hance and up Grandview Trail  it was my last trip hiking with these companions when they concluded not to join the next ambitious adventure I had planned for the spring hiking season: the North Rim Passage. It was late winter of 1998 (more early spring), and some crusty snow covered the sheltered slopes just below the rim, which was both helpful and unhelpful. The difficulty was that we couldn't locate any sign of the trail near the rim and the other part was that it didn't matter because we could walk down over the minor barrier cliffs on crusty snowbanks. I guessed that the ravine we picked was probably not the correct route, but it did work out and I did locate much of the trailbed on the eastern slope between the Coconino and the Redwall. We regained the top at Grandview Point well after dark. This was so much fun that I came back and took this as an exit for a solo trip, down Grandview, around Horseshoe Mesa, up Hance Creek, and out the same way we had come down. Next, I led another group of hikers with the main object to hike this area and avoid as many trails as we could (Grandview Circuit), and for the 3rd time I took the western ravine of the bay as the route where I knew the way even if I was sure it was not the historic trailway. The way along this slope is not obvious and is quite difficult to locate, so if you find yourself in a place without any trail and little sign of any use you should not be surprised  but the trail does still exist in some parts. Even if you don't find any apparent sign of a trail there are several ways to get through and no need to be especially concerned that you could miss a critical access and get stuck  except at the Redwall. 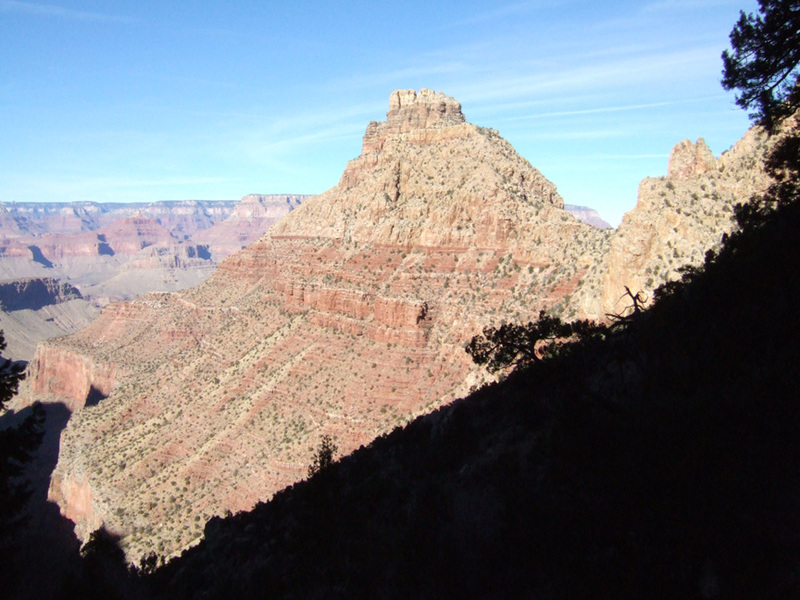 If you are a strong and experienced off-trail Grand Canyon hiker you will find something that works  if you are not a strong and experienced off-trail Grand Canyon hiker you should not be here. Even when the earliest major survey by Matthes-Evans was completed this trail had been destroyed by landslide and is not shown on this map. To find the head of this trail, locate the old viewpoint parking area (now filled in) northwest of elevation 7084. A fire-road turnoff on the south side of the road is OK as parking if you do not block the road and do not pull off the road into the trees, which could get you a ticket. A track follows the top of the cliff on the east side of the bay and is a convenient place to look down onto the route on the slope below. A view of the upper switchbacks will give you assurance that the trail exists and that you are in the right place. Older Grand Canyon hikers  contemporaries of Harvey Butchart, Jim Ohlman and others  may feel this route description is overly detailed and unnecessary. But erosion and other effects of time are making these places gradually more obscure and difficult to follow. I hope this description will be useful to the coming generation of explorers. The route descends the ravine nearest the road that is the exact southernmost head of Hance Canyon. Follow the edge of the road to the west end of the area that was the old parking pullout, step up onto the rock at the rim and discover the cairn hidden below here and marking the head of the trail. This upper slope has a variety of deer-tracks through the brush with several possibilities for the initial descent. The actual historic trailbed is clearly present in the area near the top. Soon the old trail is confined between high cliffs on both sides of the ravine. A curious-looking rockpile can be seen atop the tower to the west. Descend following a series of intact switchbacks through trees and brush  best to avoid going directly downslope and stay on the track to preserve the route from unnecessary erosion. Not far down you should arrive at a place to stand above a large boulder with a steep slide area below and to the right, and some rocky-brushy slope to the left, and no sign of a trail below. Either side is an access although it may not seem that way, but this is a hint to start looking for the crossover to the next ravine west somewhere not far below this place. Continue down the adjacent ravine either in the rocky center or among the trees going directly downslope from the spire at the point of the west wall of the upper ravine. After some distance of descent the slope conditions also deteriorate here and we can see why John Hance chose to abandon this place and construct an entirely new trail in Red Canyon for his thriving tour business. Near a large old weathered boulder in the middle of this ravine look for another track out to the west  this crossover to the next ravine is even less distinct than the last  possibly one of the few cairns here to mark the way. The crossover of this steep ridgeline between ravines clearly has no relation to the original trail and shows conclusively that the middle section of Old Hance is completely gone. Lower on the slope there are a few places that could be old trailbed but mostly either obliterated or overgrown and impassable. Descend this steep but mostly stable rocky ravine angling somewhat west in the direction of Sinking Ship (Three Castles). The bottom end of this ravine joins a larger ravine west of this minor break. The last section where the two ravines join is choked with boulders and rubble, old and new rockfall. A stubborn pine tree that has survived without being crushed holds the bank in place. From below, this tree obscures the entry to this ravine. This point where the ravines from above merge into a single drainage is the same elevation as Coronado Butte saddle to the east, which is a place to note along the Red Canyon Trail (photo). Above where these ravines combine, the main western ravine is a reasonable alternate route that I have traveled on three occasions. The Coconino section of the ravine is steep and loose. The upper slopes are mostly tree-covered and stable, unlike the track along the old trailbed. There are several minor cliff obstacles to bypass and getting out past the final cliff band at the top is not simple, but there is also less complication of changing across the various ravines and dividing slopes. The historic route is somewhat more direct to the road than this alternate; both being about an hour between here and the rim in either direction of travel. At the Esplanade cliff in the main ravine, look for a large rock and cairn on the right (piece of bedframe here). It is essential to get out of the main drainage and onto the east slope, but the terrain in making this transition can be extremely troublesome. There was a trail here, but there is little left now. Away from the bed this trail becomes more distinct and there are many small ducks to follow. The track leads down quickly and easily to a big cairn on a large hunk of limestone marking the descent into the Redwall just east of this point, which goes into the bed of the eastern ravine. The apparent instability of the slope above with numerous embedded boulders is rather frightening and this is no place to be caught in a rain or anytime shortly after. Going down to rejoin the main bed seems the obvious way, but this goes to a drop in the limestone that is not an easy bypass. The best way is to climb up onto the slope to the southeast above a small pouroff and follow this bench around the base of a limestone pinnacle separated from the cliff by a fault. The authentic trail was here, but with little sign remaining. This bench ends with a slope down into the bed. There are no more obstacles or other trail sections. At about the 4100 contour is a good seep-spring where Hance once had a cabin and a rock corral. 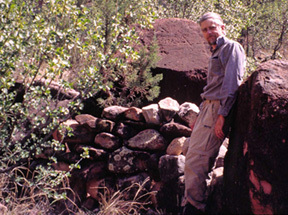 Exploring the rock structures west of the streambed is a worthwhile diversion because rediscovering history is one of the likely reasons to come here. This can also be a useful stop for camp with available water  at least I think this supply could be perennial. What is this? Upslope some distance from the corral is a very odd rock enclosure with a small tree growing inside. I cannot imagine what the purpose of this structure could have been. A good water source at the spring at the old cabin and corral site  always water at the Tonto crossing camp area  so this is a good destination in almost any season. If you think rugged, remote, off-trail routes are fun, this is plenty of fun combined with an important segment of history. For abandoned trail enthusiasts this is not to be missed. The exceptionally strong and adventurous hiker may be interested to attempt duplicating the GCT1 account of a trek from the rim to the river at Sockdolager Rapid and out by Grandview  way too much for me. Another possibility to consider is making this a loop with Red Canyon in either direction.